Children Australia links policy, research and practice issues on matters associated with children, young people and family wellbeing. It challenges some of the traditional ideas, practices and ‘silos’ associated with professional disciplines, roles and activities. 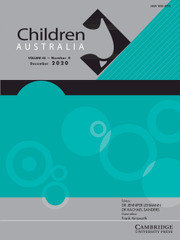 The journal provides an opportunity for professional staff, academics and others concerned with children, youth and families, to report on a wide range of topics that address Australian and international ideas and developments. It is highly relevant to a wide readership, including academics, administrators, teachers, students and all professionals working in human services fields. Debate and discussion is encouraged as a means to explore and develop the myriad practices contributing to the well-being for children, young people and their families. R. Jones (2019). In whose interests? The privatisation of child protection and social work. Bristol: Policy Press. ISBN 1-4473-5218-3 paperback. pp. 387. GBP 15.99 plus carriage GBP 12.00. Aust. $50.60 on 7 December 2018. Editorial: Towards a Universal Basic Income?